If you're making precision holes with a drill, your drill vice is as vital a piece of equipment as the drill itself. Find high-quality examples here at Euro Car Parts. When drilling through metal, wood, plastic or any other material with a high-power drill, it's important to be able to hold things in place securely. This is not just about accuracy in your work, it's also about safety. Drills can be very dangerous machines, and drill bits can break and splinter if they move unexpectedly under torque - potentially causing serious injury. 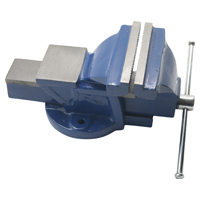 Drill vices are designed to keep pieces of material in place securely. They can be used to hold large and small pieces of material, and have a heavy base to ensure they resist rotational forces. A robust handle should allow you to hold the element in place firmly. Whatever drill vice you need, we have a wide range on offer at Euro Car Parts. All our products are available with free delivery to UK addresses, although we also have next-day and international delivery options available at great rates. Alternatively, feel free to click and collect from any of our UK stores.